To combine two normals together (normal map A to normal map B) you need to add the positive components and subtract the negative components. 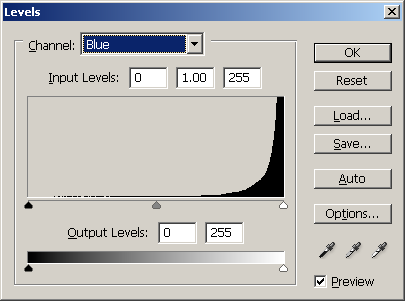 Notice how the blue channel doesn't have any negative values, this is because the Z value of a normal cannot be negative – it must point outward. 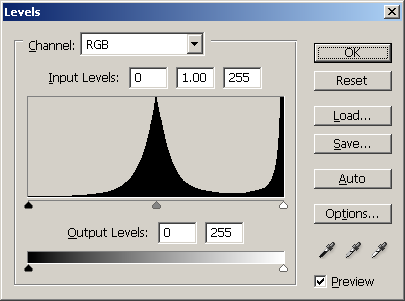 If you load up a RGB normal map image into photo shop and goto "image|adjustments|levels…" you'll see something that looks like this: This is a combined view of all three channels. 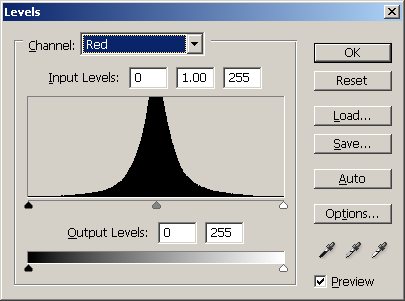 Under each channel you can see the positive and negative values as mentioned above: So from left to middle represents the quantity of negative values on X & Y (Red & Green respectively) contained in the image. From middle to right represents the quantity of postive values on X & Y contained in the image. Normal X -1 = Red Channel 0 Normal X 0 = Red Channel 127 Normal X 1 = Red Channel 255 Normal Y -1 = Green Channel 0 Normal Y 0 = Green Channel 127 Normal Y 1 = Green Channel 255 However the blue channel left to right represents the quantity of positive values on Z contained in the image. Normal Z -1 = Not represented Normal Z 0 = Blue Channel 0 Normal Z 1 = Blue Channel 255 Since the default Z (or blue) value for a normal is 1 (or 255) this channel can only subtract from this value therefore it cannot make the Z value greater then 1. Basically since we are representing normal data using an image format and that not all three channels are storing data in the same way we need to make sure we handle each channel to take this into account. Most importantly though this also identifies that each channel contains both negative and positive values represented in a positive range. Which means any technique that just Adds, Subtracts or Multiplies will result in incorrect results. Default Normal = (X 0, Y 0, Z 1) = (R 127, G 127, B 255) This default normal is the base normal for the polygon so any texel with the RGB normal value of 127,127,255 will use the polygons normal. 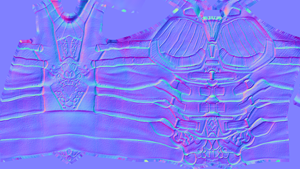 Duplicate Normal Map A and rename it to "NormalMapA_Add"
Rename Normal Map A to "NormalMapA_Subtract"
Remove negative values from "NormalMapA_Add"
Remove positive values from "NormalMapA_Subtract"
NB: Don't make any changes to the Blue channel. Note: In order to get the offset for both the add and subtract layers we need to find out how much they deviate from the default value. As stated above the default normal vector is <0, 0, 1> . And thats it! You can either flatten the layers or leave them as blend layers. I typically add the two layers into their own folder (group) which I can then flatten when needed. You can download this whole process as an action here. Great help for me.Thank you! Thanks for this information. Very very good. Thanks for this great tutorial and the action you posted. It really is helpfull in understanding how normals actually works. Thanks for this helpful tutorial and the action works perfectly! very nice tool, works perfectly sir. i am grateful, i so often see poorly combined maps, this should be on everyones radar.